This is a guest post by Omkar Mishra, where he reviews Veooz, the web based app from SETU Software Systems that provides real time social media search and analytics. This is a guest post by Omkar Mishra ((Omkar is a Social Media Junkie and a ‘So Called’ Guitarist. Firm believer of ‘Google is my only Teacher’. Works @ eClerx by Day and Batman by night. Blogs random things related to the Digital Space and Music on csharpdflat.in. Tweets at @CSharpDFlat)) where he reviews Veooz, the web based app that provides real time social media search and analytics. With all the hoopla and the social media burst around us, all the brands are on the lookout to monitor consumer conversations. This not only helps them to control something before it goes out of proportion, but also respond to consumer grievances or queries in real time. Sentiment Analysis on social media is an integral part of the strategy implementation. Sentiments are feelings or opinions by the users about the brand. While there are many paid as well as free tools available, the automated sentiment analysis system can be better for now. Veooz is one such venture by SETU Software Systems, which tries to aggregate all such conversations and weight the positive/negative sentiment around them. The tool is still in beta and at least for now, it is FREE!! So how is this site any different from the already existing social aggregator SocialMention? Well, I tried to find that out and these are my conclusions about Veooz. 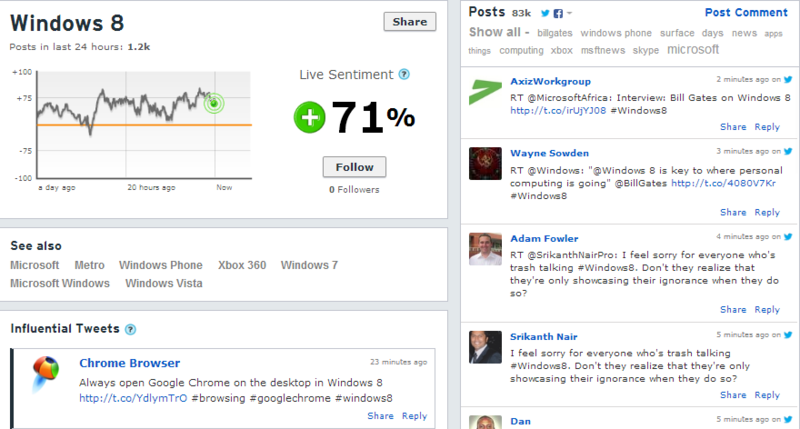 The interface is user friendly and shows the top 5 trending topics across with their net sentiment display. Veooz does not include neutral posts while calculating sentiments. So in the below picture, Narendra Modi has 57% positive speaking people as against 43% negative, which is somewhat not in his favour. I searched about the upcoming Windows 8 by Microsoft to gauge the sentiment of the consumers on the new operating system along with the conversations surrounding it. According to Veooz, 71% of the conversations around the new operating system were positive from the 83K posts found. SocialMention on the other hand, could only yield 445 mentions when queried for Windows8. The sentiment analysis would always be different for different engines with different text filters, algorithms and total volume in place. SocialMention showed a sentiment ratio of more than 90% positive mention as compared to 71% of Veooz. In terms of pulling out sheer volume of posts, Veooz does have the competing edge here. The tool also shows some of the influential users who have tweeted about the topic which the brands can target. Based on my understanding, these are solely based on the number of followers. Besides showing the number of posts around the topic overall as well as for the past 24 hours, it gives you options of topics related to the ones you have queried for (in my case Windows8). The topics are more or less connected. (I did try to search for an Indian Film Rowdy Rathore as well to cross check and it did give some intelligent results). In case you are an agency, monitoring on the buzz around a brand’s topic, the options allow you to reply from the tool itself which can shorten your time to respond. Filtering by the most used keywords help you narrow your search to your own subset of topics within the larger set. However, I would love to see a multiple selection of topics available within the set to help me manage a broader spectrum than clicking and filtering each one at a time. The tool being real time does find some meaningful content leaving out junk and spam. Although, sometimes you would have to play smart with your keyword search as well (when searching for ‘Apple’, the tool found mentions of apple the fruit as well). So be selective and intelligent with your queries. Interesting comments are displayed at the bottom of the block which according to Veooz are ‘selection of informative and interesting comments coming from Facebook, Blogs and News comments’. However, for all the searches I did, I found the section comments neither interesting nor informative. What more can Veooz do? Veooz, primarily being a social compiler of sorts which runs sentiment analysis on them, can offer a lot more which can help users derive better and more business driven insights. 1. For once, streaming the whole lot of posts, (if there are more than 50K of them) is not humanly possible. Having a downloadable option for these posts can be a great initiative, which will not only give the users the content but the source and the user along with the date of the posted content. 2. Having worked with Radian6 and Simplify360, one thing which can also add an extra dimension to this could be the Twitter Reach of that specific keyword searched. Twitter does not provide its reach metric like Facebook does in it’s insights. Having them baked in within each message may give you a fair idea of the negativity reach as compared to the positive reach of the brand. Mostly, the reach calculated here could be the Potential Reach (based on your followers and their followers network). But the absolute True Reach metric till yet is not available for Twitter and any tool ( as far as I know) does not calculate it to the optimum level. 3. The ability to select each social network as an independent one. As of now, Veooz gives you an aggregate of all the social networks and blogs combined. It would be a great addition, if they could let the user choose which type of network they would want to query information from. SocialMention does offer the same option, which can be a good addition to the tool kit of Veooz. 4. Analytics and pictorial representation and graphs go hand in hand. As of now, Veooz offers a text based layout in which the user has to drill down manually with eyeball checks as to which post or topic can have an impact. Providing the same option with attractive graphs lets the user see the overall picture in a compact manner. Something like a Media Type or Source Type Distribution along with top 10 authors contributing about the topic or top 5 hashtags related to the topic. This would let the users drill down on the topic in a quick and easy manner without have to find things themselves. Overall, Veooz is a great initiative and does provide a comprehensive coverage of the topic searched within the tool with sentiments. But with the easy to go social media tools coming up every day, Veooz could try to be more user friendly with easy to access features. Somewhere, it still leaves something to be desired.